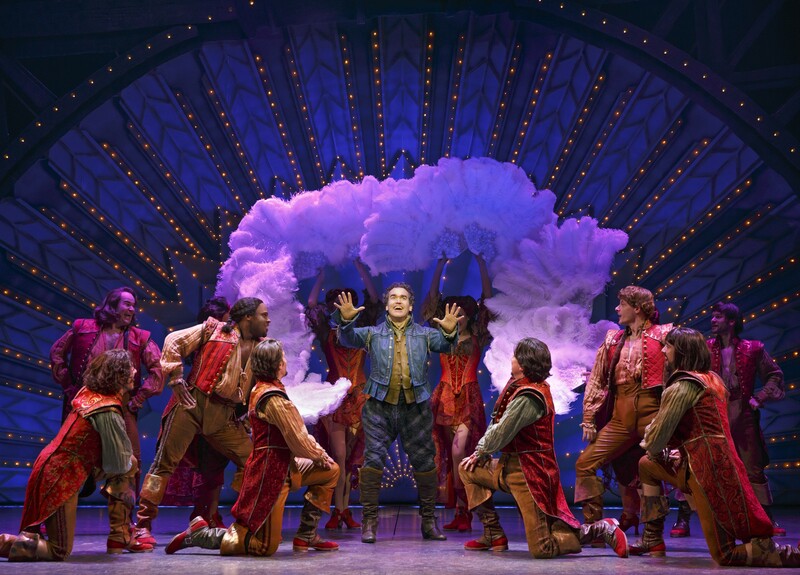 From Spamalot to The Book of Mormon to decades worth of editions of Forbidden Broadway, new musical comedies have found a prime target for their humor in theater itself. 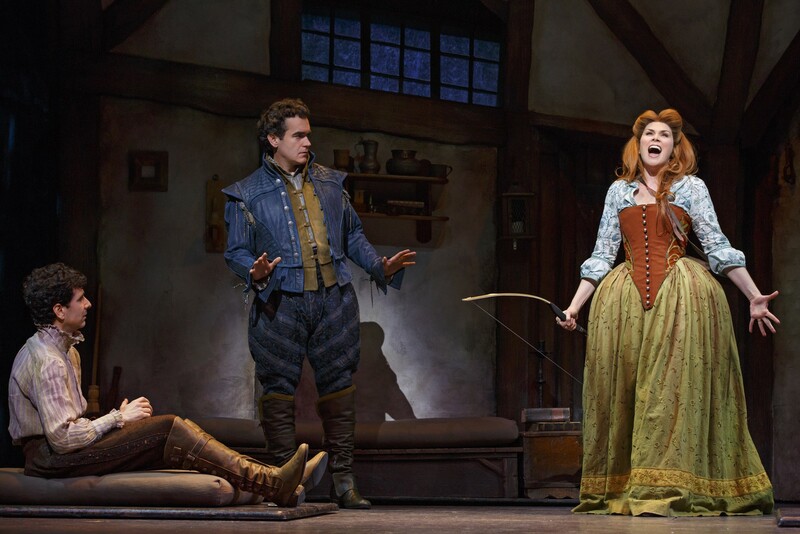 Something Rotten!, a guffaw-out-loud new production in the Mel Books mold that skipped the usual out-of-town trial (and error) run for a cold opening at Broadway’s St. James Theatre, spoofs not only the last half century of Broadway hits but also one of the most sacred of theatrical cows: William Shakespeare himself. Here, the Bard is seen as a bovine (or at least boorish) rock-star figure. 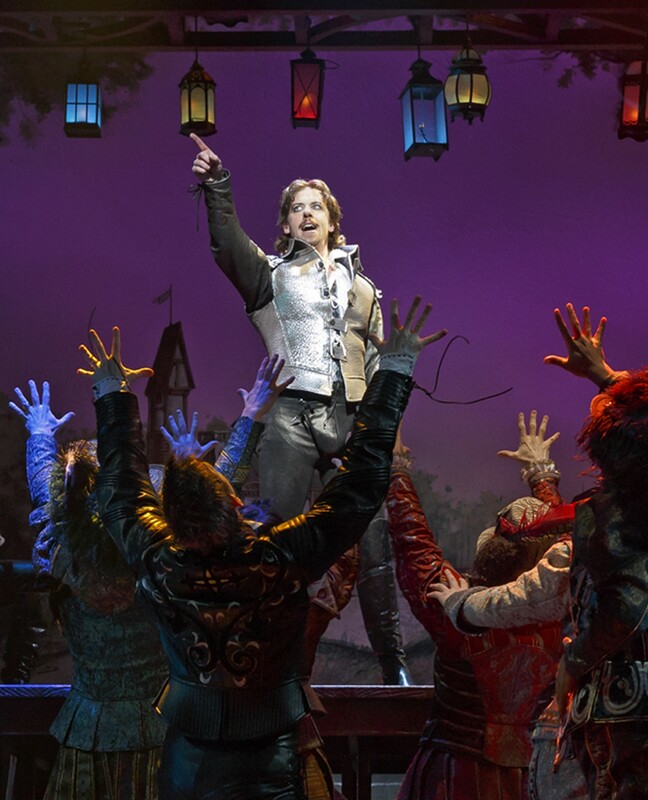 Played by Christian Borle with perfect peacocklike vanity, he’s ruthless enough to stoop to theft to defend his perch as the king of Elizabethan theater. Our hero, though, is an everyman with a name straight out of A Midsummer Night’s Dream: Nick Bottom, personified by Brian D’Arcy James in a spot-on comic performance. An aspiring theater impresario working with his more literary minded brother, Nigel (John Cariani), Bottom is confounded by Shakespeare’s success — in his opening song, “God, I Hate Shakespeare,” he even rhymes “his plays are wordy” with “that little turd, he” — and desperate to mount a hit of his own. So Nick turns to one Thomas Nostradamus (a daffy Brad Oscar), the famed prognosticator’s nephew, for guidance on the Next Big Thing. And Nostradamus does indeed have acute visions of theater’s future — though that vision isn’t quite 20/20. Soon, the Bottoms are preparing the world’s “first” Broadway-style musical, and one that will pre-empt what Nostradamus believes will be Shakespeare’s biggest hit: Omelet. Previous Previous post: Broadway review: ‘Doctor Zhivago’ sings!